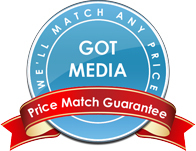 Verbatim has been long recognized as a top quality blank CD-R media manufacturer and GotMedia.com offers a full line of bulk and printable surface CD-R media right here in Orange County, CA. Available in Shiny Silver Thermal Printable, White Inkjet Printable, Silver Inkjet Printable, White Thermal Printable for color thermal printers Prism, Prism Plus, Everest, Teac P-55 and more, you really can't go wrong with the superior stability and compatibility that you get with Verbatim CD-R and Verbatim Inkjet Printable Media. As an established recognized leader for quality and reliability, be sure to check out our line of Verbatim BD-R Media and Verbatim DVD-R Media products as well! 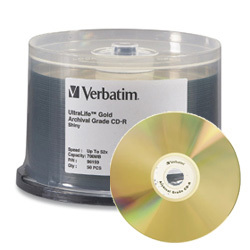 Verbatim Data Life Plus CD-R is professional grade with superior reliability and consistency. This Verbatim CD-R has a white thermal printable surface for use with a color thermal printer. These are also hub printable which means you can print on more of the surface and closer to the center hole. The print surface is Everest and P-55 approved. You can also write on the surface with a CD pen. Verbatim Data Life Plus CD-R is professional grade with superior reliability and consistency. This Verbatim CD-R has a white thermal printable surface for use with a color thermal printer. The print surface is Everest approved. You can also write on the surface with a CD pen.